Mr Cameron's party conference speech was seen as a "triumph"
David Cameron has adopted one of the more unusual techniques for making good speeches, a BBC documentary reveals. Film maker Michael Cockerell said the Conservative leader has taken on board legendary orator Enoch Powell's tip of delivering speeches on a full bladder. 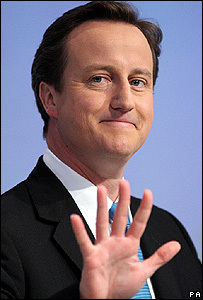 Mr Cameron "specifically refrained from using the loo" before this year's Tory conference speech, Mr Cockerell added. The resulting inner tension helped Mr Cameron to deliver a memorised speech seen as a "triumph", he added. The Tory leader spoke for an hour at the conference in October without an autocue or script, in a performance credited with lifting his party's spirits at a time of positive opinion poll ratings achieved by Gordon Brown in his early days as prime minister. Mr Cockerell observed Mr Cameron's behaviour for his BBC Two documentary Dave Cameron's Incredible Journey. In an article to accompany the programme, for the BBC News website, he said: "Cameron knew that he had to make the speech of a lifetime to give the Tories a bounce in the polls and make Brown think again about the election. "Team Cameron worked round the clock on the leader's speech. He took the risky decision that he would make it wandering around the stage without a script or autocue." Mr Cameron leader hoped to recreate the success of his unscripted party conference speech in 2005, after which he overtook his rivals to win the leadership contest. Mr Cockerell, who went behind-the-scenes to watch Mr Cameron at work, added: "Cameron also had another unlikely secret for oratorical success: he had picked it up from watching a film I made 10 years ago about the best Tory public speaker of his time - Enoch Powell. "Cameron specifically refrained from using the loo before going onto the stage make his hour-long speech." According to Mr Cockerell this set in motion a chain of events that now sees the Tories ahead of Labour in the opinion polls. He writes: "The speech was seen as a triumph. With the polls showing the Tories bouncing back sharply after their conference, Brown suddenly called off the election. "Since then the prime minister's popularity has been going South as fast as the Tory Leader has been rising." Mr Powell, who died in 1998, was best known for his 1968 "rivers of blood" speech on immigration, which saw him sacked from the Tory frontbench. Dave Cameron's Incredible Journey is on BBC Two on Thursday 20 December at 1900 GMT.